No, we’re not giving away Facebook. We are, however, giving away 3 Audioboxes ON Facebook, including the 1818VSL, a 44VSL and a 22VSL. If you’re a lucky winner, you also get Studio One 2 PROFESSIONAL edition. Spared no expense. All you have to do is ‘Like’ us over at Facebook and click the Sweepstakes Tab. Enter some hum-drum information and you’re entered. We will announce the winners on January 9 of 2012. Best to you! See official rules here. NO PURCHASE OR PAYMENT OF ANY KIND IS NECESSARY TO ENTER OR WIN THIS SWEEPSTAKES, The PRESONUS AUDIOBOX GIVEAWAY. GIVEAWAY (“Sweepstakes”) begins on November 11, 2011 when announced by PreSonus at the PreSonus Facebook Page and ends at 11:59:59 p.m. Central Time on January 9, 2012 (“Sweepstakes Period”). You must be a Facebook member to enter. Go to the PreSonus Facebook page at http://www.facebook.com/pages/PreSonus-Audio-Electronics/44626647633 and click on the “Sweepstakes” tab. You must “Like” the PreSonus page and enter your name, email address and age on the sweepstake entry form. By entering this sweepstakes you will be automatically subscribed to the PreSonus monthly email newsletter. You may unsubscribe to this newsletter at any time. Only one entry per person will be accepted. PreSonus is the official sponsors of this Sweepstakes. This promotion is in no way sponsored, endorsed or administered by, or associated with, Facebook. You understand that you are providing your information to PreSonus and not to Facebook. The information you provide will only be used for contacting the Sweepstakes winners. 2. ELIGIBILITY: From the official time and date of the start of the Sweepstakes Period through the final date of prize fulfillment, you must have a valid shipping address that FedEx can deliver to. You must also be 18 years of age or older as of the official time and date of the start of the Sweepstakes Period. Sweepstakes is void in Puerto Rico, the U.S. Virgin Islands, U.S. Military installations in foreign countries, and all other U.S. territories and possessions and where restricted or prohibited by law. United States law governs this Sweepstakes. Employees of PreSonus, its advertising and promotion agencies, and any other entities involved in the design, promotion, marketing, administration or fulfillment of this Sweepstakes, including without limitation, Facebook, Inc., as well as each of their parent corporations, subsidiaries and affiliated companies (collectively, “Sweepstakes Entities”), and their immediate families (defined as spouse, mother, father, sisters, brothers, sons, daughters, uncles, aunts, nephews, nieces, grandparents and in-laws, regardless of where they live) and members of their households (whether or not related), are ineligible to participate in this Sweepstakes. 3. DRAWING AND NOTIFICATION: Winners of the prizes described below will be selected on or about January 9, 2012, by Sponsor, provided that such drawing date may be changed in Sponsor’s discretion. Odds of winning a prize depend on the number of eligible entries received. Potential winners will be notified via email. Winner must “Like” the PreSonus page and be a friend of PreSonus at time of drawing. Failure by the potential winner to respond to such notification within three (3) days will result in disqualification of the potential winner and an alternate potential winner will be selected. The return of a potential winner’s notification, prize information, or the prize as undeliverable or rejection of the prize by the potential winner will result in disqualification of the potential winner and an alternate potential winner will be selected. Sponsor reserves the right to modify the notification procedures in connection with the selection of any alternate potential winners, if any. The authorized account holder is defined as the natural person who is assigned to an email address by an Internet Service Provider, online access provider or other organization (e.g., business, educational institution, etc.) that is responsible for assigning email addresses for the domain associated with the submitted email address. With respect to each winning entry, the winner may be required to provide proof that the winner is the authorized account holder of the email address associated with the winning entry and is otherwise eligible to enter the sweepstakes. No transfer, or cash or other substitution of prizes allowed except that Sponsor reserves the right, in its sole and absolute discretion, to substitute a prize or prize component of comparable or greater value. Allow 4-6 weeks for delivery of prize. Sponsor will not replace any lost or stolen prizes once in winner’s possession. Total value of all prizes to be awarded is approximately $3,000. 5. PRIZE CONDITIONS: Except where prohibited, potential prize winner may be required to execute an Affidavit of Eligibility, a Liability Release and a Publicity Release, and a Tax Acceptance Form (“Affidavit/Release”). If the potential prize winner is under 19 years of age and is a resident of the State of Alabama, or Nebraska, then the parent or legal guardian of such winner also must sign any documents required herein. If the prize winner is under 21 years of age and is a resident of the State of Mississippi or Pennsylvania, then the parent or legal guardian of such winner also must sign any documents required herein. Such documents must be signed and returned by the date and/or time indicated within such documents. If the potential prize winner fails to sign and return such documents within that time, or if an entrant is found to be ineligible, or if an entrant does not comply with the Official Rules, then the potential winner will be disqualified and an alternate potential winner will be selected. Entrant waives the right to assert as a cost of winning a prize any and all costs of verification and redemption to redeem said prize and any liability which might arise from redeeming or seeking to redeem said prize. Sponsor is not responsible for fraudulent calls or emails made to entrants not by the Sponsor. All federal, state or other tax liabilities (including income taxes) arising from this Sweepstakes will be the sole responsibility of each winner. Except where prohibited by law, each winner’s entry and acceptance of the prize constitutes permission for the Sweepstakes Entities to use said winner’s name, photograph, likeness, statements, biographical information, voice, and city and state address for promotional or advertising purposes in connection with this Sweepstakes on a worldwide basis, and in all forms of media, now or hereafter known, in perpetuity, without review, permission or further compensation. All entries are subject to verification prior to awarding of prizes. Eligibility, age, and claims made by prize winners also are subject to verification prior to awarding of prizes. 6. SWEEPSTAKES CONDITIONS: VOID WHERE PROHIBITED. This Sweepstakes is subject to all applicable federal, state and local laws of the United States. By participating, entrants agree to be fully and unconditionally bound by these Official Rules and the decisions of the Sponsor, and waive any right to claim ambiguity in the Sweepstakes or these Official Rules. Winners and entrants also agree to release, discharge, indemnify and hold harmless the Sweepstakes Entities and each of their respective officers, directors, employees, representatives and agents from and against any claims, damages, disability, attorneys’ fees, and costs of litigation and settlement, as well as any liability due to any injuries, damages or losses to any person (including death) or property of any kind resulting in whole or in part, directly or indirectly, from (i) redemption, acceptance, possession, ownership, misuse or use of any prize or participation in any Sweepstakes-related activity or participation in this Sweepstakes, or (ii) printing, distribution or production errors. Sponsor or its affiliates may rescind any promotion found to contain such errors without liability at its sole discretion. NEITHER SPONSOR NOR THE SWEEPSTAKES ENTITIES MAKE ANY WARRANTY, REPRESENTATION OR GUARANTEE, EXPRESS OR IMPLIED, IN FACT OR IN LAW, RELATIVE TO THE USE OF ANY PRICE, INCLUDING, WITHOUT LIMITATION, QUALITY MERCHANTABILITY OR FITNESS FOR A PARTICULAR PURPOSE (UNLESS SPONSOR PROVIDES THE PRIZE WINNER WITH WRITTEN WARRANTIES). FURTHER NO RESPONSIBILITIES ARE ACCEPTED FOR ANY ADDITIONAL EXPENSES, OMISSIONS, DELAYS OR ACTS OF ANY GOVERNMENT OR AUTHORITY. 7. RESTRICTIONS: Each prize package consists of only those items specifically described as part of the prize. Sponsor may at Sponsor’s sole and absolute discretion provide different prizes of equal or greater value. Sponsor shall not be liable to any winner or any person claiming through such winner for failure to supply the prize or any part thereof, by reason of any acts of God, any action(s), regulation(s), order(s) or request(s) by any governmental or quasi-governmental entity (whether or not the action(s), regulations(s), order(s) or request(s) prove(s) to be invalid), equipment failure, threatened terrorist acts, terrorist acts, air raid, blackout, act of public enemy, earthquake, war (declared or undeclared), fire, flood, epidemic, explosion, unusually severe weather, hurricane, embargo, labor dispute or strike (whether legal or illegal) labor or material shortage, transportation interruption of any kind, work slow-down, civil disturbance, insurrection, riot, or any other cause beyond Sponsor’s sole control. 8. LIMITATIONS OF LIABILITY: Sweepstakes Entities are not responsible for: (1) lost, late, misdirected, undeliverable or incomplete entries due to system errors or failures, or faulty transmissions or other telecommunications malfunctions and/or entries; (2) technical failures of any kinds; (3) failures of any of the equipment or programming associated with or utilized in the Sweepstakes; (4) unauthorized human and/or mechanical intervention in any part of the entry process or the Sweepstakes; (5) technical or human error which may occur in the administration of the Sweepstakes or the processing of entries; or (6) any injury or damage to persons or property which may be caused, directly or indirectly, in whole or in part, from entrant’s participation in the Sweepstakes or receipt or use of any prize. If for any reason an entrant’s entry is confirmed to have been erroneously deleted, lost or otherwise destroyed or corrupted, entrant’s sole remedy is another entry in the Sweepstakes. Sponsor may prohibit an entrant from participating in the Sweepstakes or winning a prize if, in its sole discretion, it determines that said entrant is attempting to undermine the legitimate operation of the Sweepstakes by cheating, hacking, deception, or other unfair playing practices (including the use of automated quick entry programs) or intending to annoy, abuse, threaten or harass any other entrants or Sponsor’s representatives. If for any reason this Sweepstakes is not capable of running as planned, including, but not limited to, infection by computer virus, bugs, tampering, unauthorized intervention, fraud, or any other causes beyond the reasonable control of Sponsor which corrupt or affect the administration, security, fairness, integrity or proper conduct of the Sweepstakes, then Sponsor reserves the right at its sole discretion to cancel, terminate, modify or suspend all or any part of the Sweepstakes and to select potential winners from among all eligible entries received by Sponsor up until the time of such cancellation, termination, modification or suspension, as applicable. CAUTION: ANY ATTEMPT BY AN ENTRANT TO DELIBERATELY DAMAGE THE WEBSITE OR UNDERMINE THE LEGITIMATE OPERATION OF THE SWEEPSTAKES MAY BE IN VIOLATION OF CRIMINAL AND CIVIL LAWS AND SHOULD SUCH AN ATTEMPT BE MADE, SPONSOR RESERVES THE RIGHT TO SEEK CIVEL AND/OR CRIMINAL PROSECUTION AND DAMAGES (INCLUDING ATTORNEY’S FEES) FROM ANY SUCH ENTRANT TO THE FULLEST EXTENT OF THE LAW. 9. RULES/WINNER LIST: For a copy of the Official Rules or for a winners list, write to PreSonus, 7257 Florida Blvd., Baton Rouge, LA 70806, Attn: Facebook AudioBox Giveaway. Winners list becomes available after completion of Sweepstakes. Do not contact Facebook for any information about this Sweepstakes. 10. 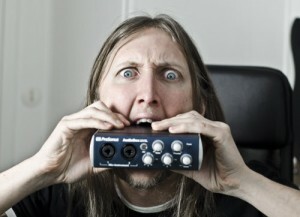 SPONSOR: PreSonus Audio Electronics, Inc. © 2011 PreSonus. All Rights Reserved.